Tuesday marks the next step in a legal faceoff between Malaysian authorities and the well-known political cartoonist Zulkiflee Anwar Haque, also known as Zunar. Hearings will resume in civil lawsuit filed by Zunar that challenges the legality of his arrest and detention in September 2010. 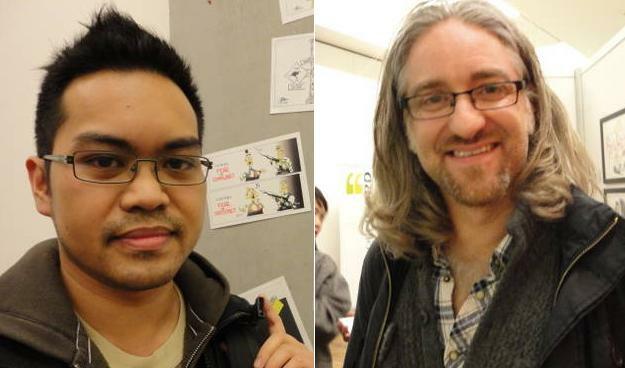 Malaysian police arrested him hours ahead of the scheduled launch of a new book of political cartoons, Cartoon-o-phobia. He was held until the next day on the accusation that his book violated the country's repressive Sedition Act. Although he was released without being formally charged, police served a search warrant at his office and seized dozens of copies of his book. Zunar's work, exuberant and sharp, goes after all political sides. At age 50, he doesn't feel he has to spare any political figure, from former Prime Minister Mahathir Mohamad to current Prime Minister Najib Razak to oppositionist Anwar Ibrahim. 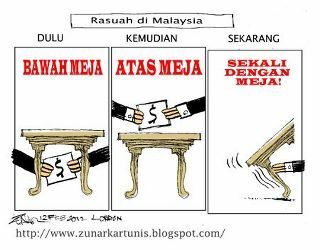 In a 2010 interview, Zunar said his inspiration comes from Thomas Nast, the 19th American cartoonist who took on the corrupt politicians of his day. In his current lawsuit, Zunar is seeking reimbursement for loss of earnings, along with unspecified damages that he hopes will deter officials from pursuing similar cases. But in a country where it is far more common for the government to be the complainant in press cases, challenging authorities in court takes some measure of courage. At the most recent hearing, in January, the arresting officer testified that Zunar's work "could have created hatred, misunderstanding, confusion, and loss of trust." This is not the first time Zunar has gone to court in defense of his work. In June 2010, under the Printing Presses and Publishing Act (PPPA), the Home Ministry banned severalcompilations of his cartoons. The government asserted the cartoons, many of them critical of Razak's administration, were "prejudicial to public order," according to news reports. The compilations included cartoons that appeared on the independent news website Malaysiakini from 2005 to 2009 and in Isu Dalam Kartun, a monthly magazine. Zunar and Malaysiakini filed for a judicial review, but the High Court in Kuala Lumpur upheld the ban in July 2011 and threatened to revoke printers' licenses if any dared reproduce the volumes. Malaysian governments have long leveraged the Printing Presses and Publications Act's many arbitrary provisions, including Home Ministry discretion over the issuance of publishing permits, to stifle press freedom. In a September 2011 speech, Prime Minister Razak promised to amend the PPPA by doing away with the legal requirement for news publications to renew their publishing licenses on an annual basis. Five months later, even that modest reform has not been made into law. Yet were that reform to be implemented, the minister of home affairs would still retain broad authority to refuse permission to publish any materials he unilaterally determines "likely to be prejudicial to public order, morality, security ... or national interest" and to revoke permits without the legal recourse of judicial review, according to the law. Journalists may still be jailed or fined for spreading "false news" under the Printing Presses and Publication Act. And if the Sedition Act doesn't further dampen criticism, officials can also resort to the Official Secrets Act or the Internal Security Act, which carry potential jail terms for guilty convictions, to curb media criticism and encourage self-censorship among journalists. And that leaves Zunar, seriously, contemplating his next move. 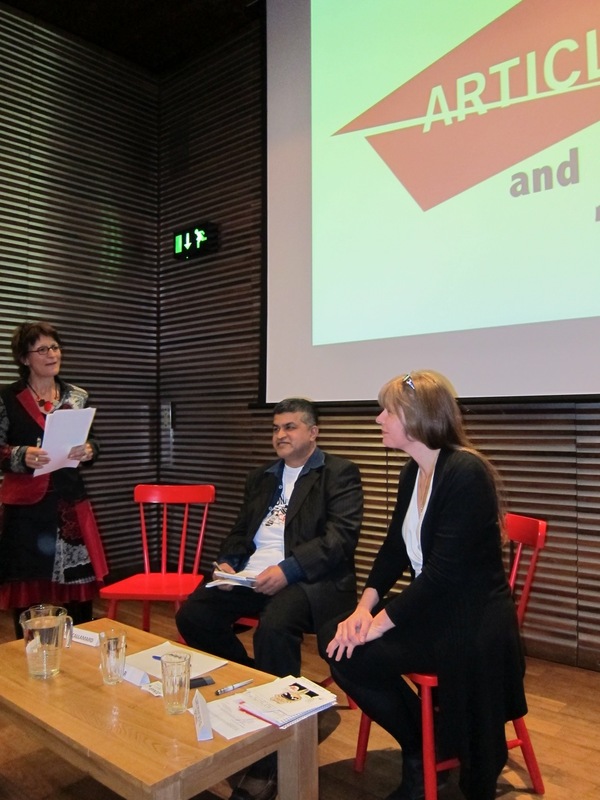 Zunar Takes His Campaign To The UK! 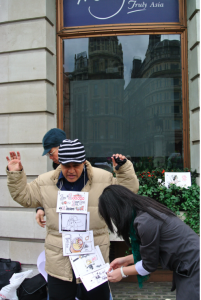 The crowds passing through ‘Malaysia’s Speakers’ Corner’ on Trafalgar Square had the pleasure of watching cartoons being created live this weekend, as the ‘notorious’ Zunar took his campaign to London. 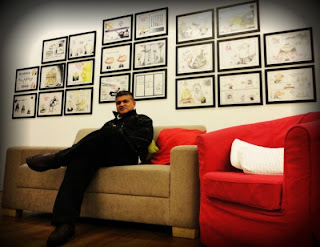 Zunar does in Malaysia what dozens of successful cartoonists do in the UK and in other free countries, which is lampoon the political leadership. It is generally regarded as a healthy tonic to be able to make fun of your leaders and to point out their weak spots. like being shown as a condom. arrest and try the cartoonist for sedition! 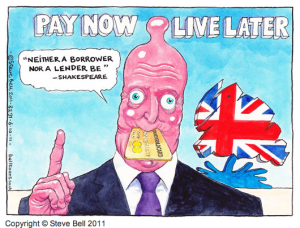 n the UK, David Cameron has to put up with being portrayed as condom, owning to his rather smooth and ‘baby-bottom’ features! This is an annoyance that is treated as a sign that a politician has arrived and is sensibly laughed off. However, the BN Malaysia establishment has reacted differently. They do not like to be portrayed in anything but fawning tones, it turns out, and they have brought out all their anti-terrorist weapons of law and state to suppress Zunar. 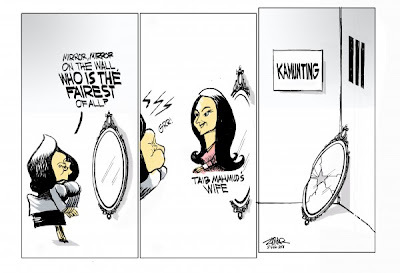 It seems has has had far too many people in stitches over his portrayal of a government run by a mild-mannered and hen pecked husband, half the size of his corpulent and domineering wife Rosmah! One to please Taib? 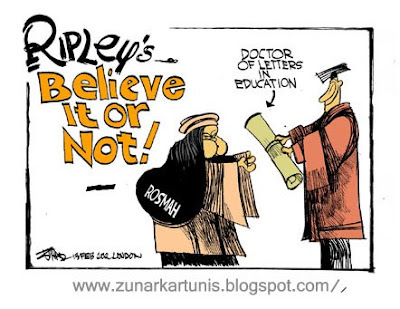 Zunar has a laugh about how his younger wife at least must annoy Rosmah! So it was that on the eve of publication of his latest book Zunar was arrested at his home at night by a gang of police, who seized all the copies of the book and of his earlier six books, which had equally poked fun at earlier politicians such as Badawi and Mahatir. Malaysian Tourist Office to draw his protest! Zunar was then transferred through the night to seven different police lock-ups, so that protesters would not know where to find him! For the entire period he was kept in painful handcuffs. The police then tried to hold him in remand on the grounds that he was a dangerous seditionist, threatening to overthrow the state. The Magistrate, however, asked what was dangerous about the cartoons and the police could not answer, because they had not actually reviewed the drawings! However, the state (i.e. BN/UMNO) has continued with its determination to intimidate, silence and jail Zunar for mocking politicians who would rather pretend they are special and superior human beings. He faces trial next month when he returns to Malaysia. As ever these bully boy, BN tactics have backfired. They have only boosted Zunar’s fame and influence, turning a cheeky cartoonist into a national figure of protest! 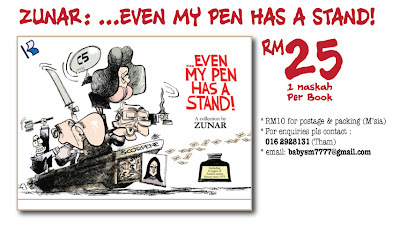 With great courage Zunar has stuck to his guns… or rather his own particular weapon, which is an inky pen. 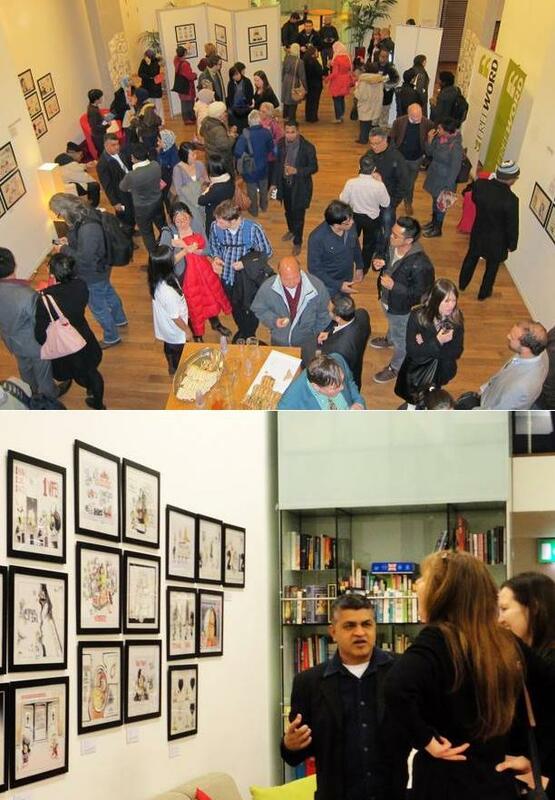 For the past months he has been exhibiting in Europe and now has come to London with a collection of his latest cartoons on display at an Exhibition supported by the Freedom of Speech NGO, Article 19 at the Free World Centre in Farringdon Road, London. He launched the exhibition to a packed audience last week and told listeners that when a regime can no longer afford to be laughed at it is a regime that is waiting to fall. They laughed. 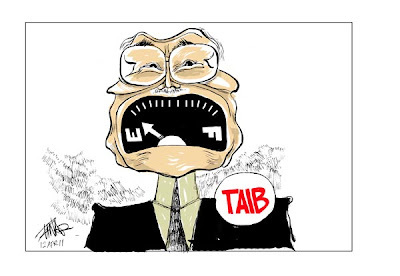 It will come as no surprise that Taib has also been an irresistible staple of Zunar’s humour. 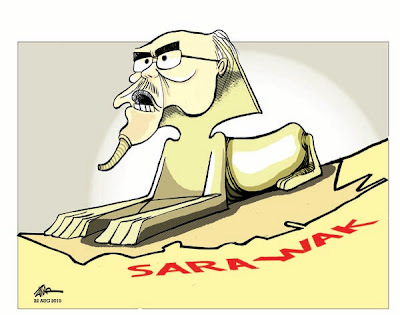 The greedy old dictator has been portrayed as a sphinx and a second Mahatir. Same old 'progress and development'! But, his latest cartoon has the old boy running on empty. Still spouting the same old Sixties rhetoric about progress and development, but now with Sarawak’s resources fast disappearing and without much progress for anyone else but him, he is shown as a spent force! 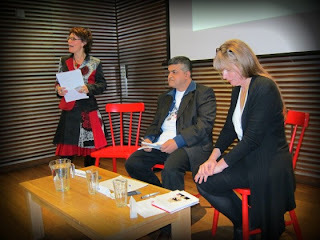 Acclaimed Malaysian political cartoonist Zunar (néeZulkiflee Anwar Haque) premiered his latest exhibition, ‘To Fight Through Cartoon’, to a full house yesterday evening at the Free Word Centre in London, UK. 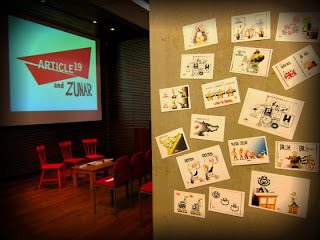 Hosted by ARTICLE 19, the event showcased Zunar’s banned cartoons and highlighted the deteriorating state of freedom of expression in Malaysia. 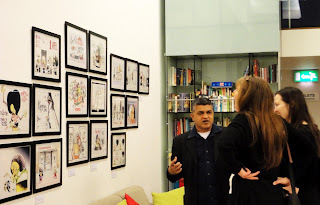 Zunar’s drawings are powerful in their handling of controversial themes of public corruption, political dissent and the excessive power of the police and judiciary in his home country. As a result, his cartoons are prohibited from being published in state-controlled newspapers and all seven of his books are banned in Malaysia. The launch of his most recent publication ‘Cartoon-O-Phobia’ in September 2010 was hindered when the police stormed the event, seizing all copies of the book and unlawfully detaining him overnight. During the London exhibition launch, Zunar reassured the audience and pledged to continue drawing cartoons “until the very last drop of ink”. 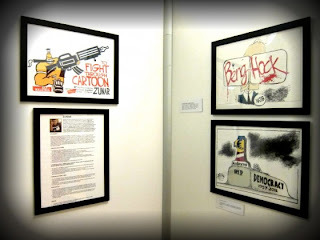 This is Zunar’s first solo exhibition and is scheduled to run until Thursday, 15 March 2012 (Monday to Friday, 9am to 9pm). 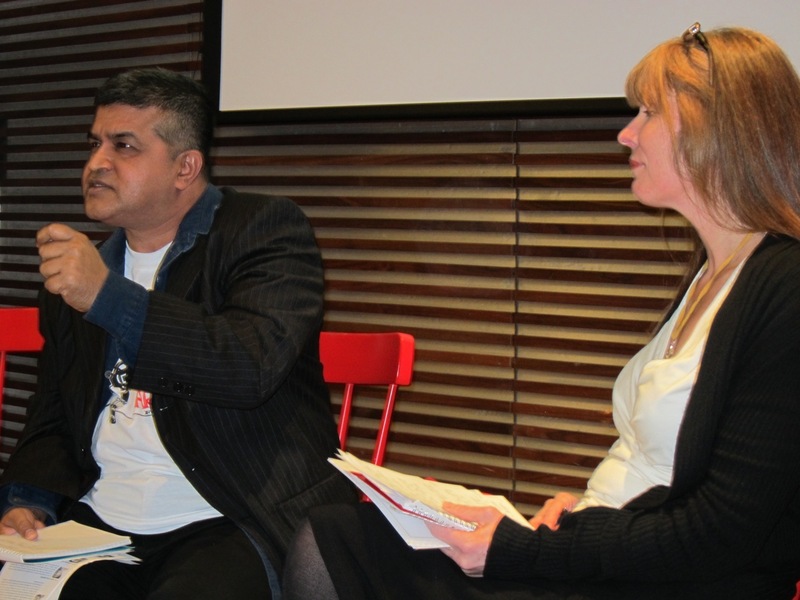 Political cartoonist Zunar has taken his controversial drawings to the United Kingdom. 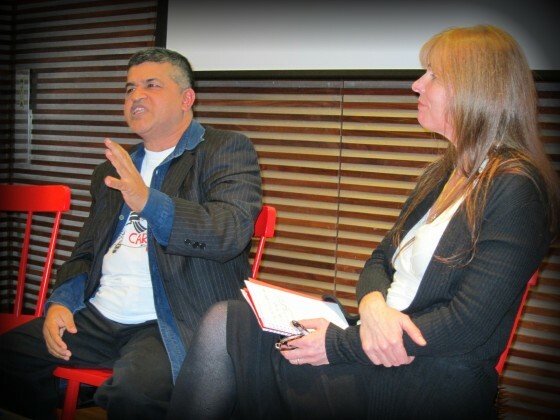 PETALING JAYA: Controversial political cartoonist Zunar has taken his drawings to the United Kingdom. In a solo exhibition yesterday at the Free Word Centre on 60 Farringdon Road, London, Zunar, whose real name is Zulkiflee Anwar Ulhaq, showed 80 of his pieces there. 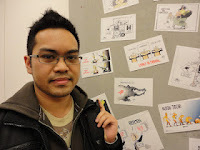 Entitled “To Fight Through Cartoon”, his artwork has been divided into four categories: “Najib”, “Rosmah”, “Conspiracies against Anwar” and “General Issues”. 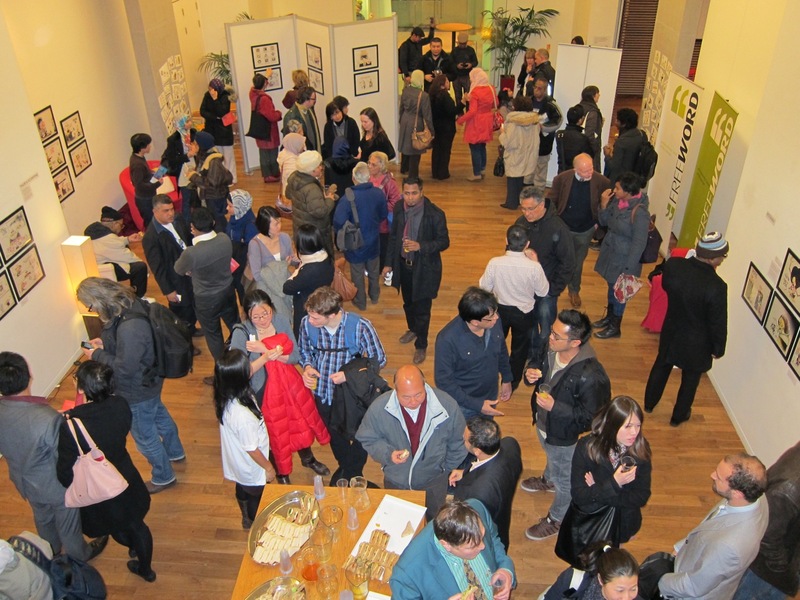 The exhibition was organised by “Article 19″, a London-based human rights NGO that looks into freedom of expression and information. His artwork will be available for free viewing until March 13, from 9am to 9pm, Monday to Friday. In a press statement, Zunar said that all Malaysians had to play their part in what he claimed was a “moral crisis” taking place in Malaysia. “It is morally wrong for us to keep quiet… All Malaysians should play their part. Let us stand together and fight. As a cartoonist, this is my little contribution in this struggle. How can I be neutral (when) even my pen has a stand,” he said. 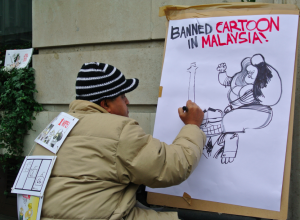 According to Zunar, drawing these cartoons was his way of taking a “firm stand” against Malaysia’s government, whom he called a “repressive regime”. More than 100 people, including Radio Free Sarawak and Sarawak Report founder Clare Rewcastle Brown, turned up for the event. 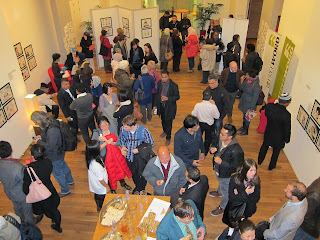 Many Malaysians and local Britons were also present at the exhibition. Zunar is no stranger to controversy, and has often paid the price for drawing his cartoons. 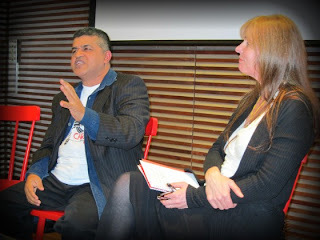 On Sept 24 2010, Zunar was detained for two days over the publication of his book, “Cartoon-O-Phobia”. Later, the government would also ban several of his works, including “Gedung Kartun”, “Perak Darul Kartun” and “1Funny Malaysia”. His work has been known to target many political figures, especially Najib and his wife, Rosmah Mansor. He has also touched on the Altantuya Sharibuu issue, the Scorpene submarines and Anwar Ibrahim. Zunar: Getting ideas is a breeze, thanks to our politicians. Feb 16: Political cartoonist Zulkiflee Anwar Ulhaque said he did not at all find it a challenge to get ideas for his works, and he has Malaysian politicians to thank for. “It is a bit easy because I live in Malaysia. 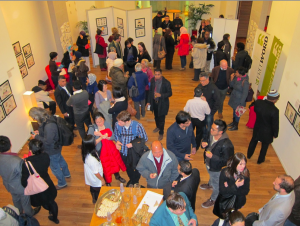 Malaysian politicians provide me ideas every day," he told a 100-strong audience who attended the launch of his latest exhibition in London yesterday. "The Prime Minister and his cabinet ministers look very smart and intelligent, until they open their mouth. The moment they start to open their mouths, I can start open my sketch book," said the cartoonist popularly known as Zunar, replying to a question from the audience. 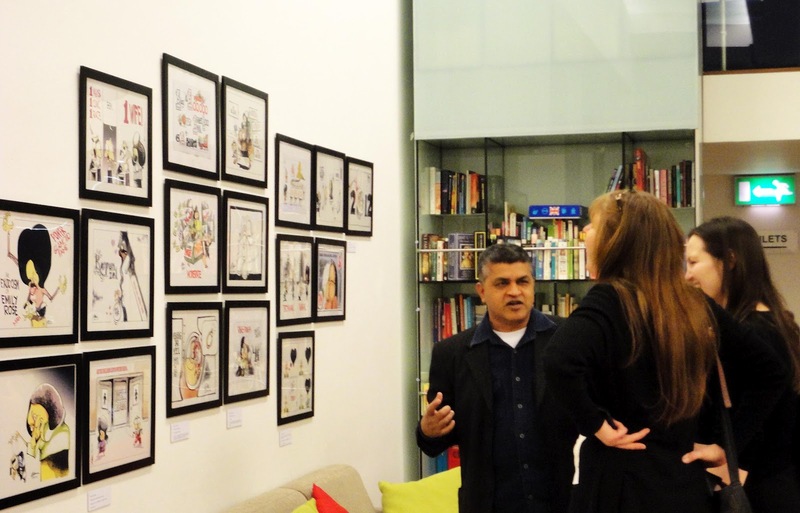 Organised by Article 19, a UK-based non-governmental organisation, the event is Zunar's first solo exhibition and will run until March 13. 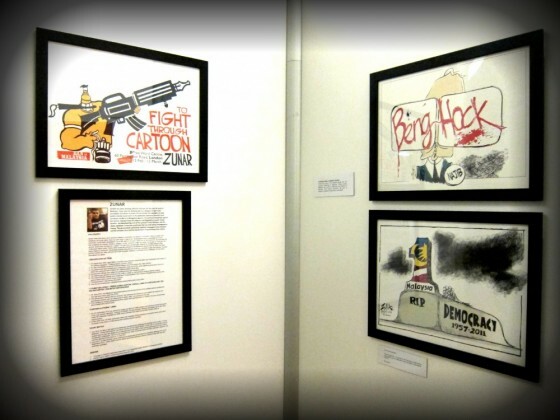 With the theme "To Fight Through Cartoon", it boasts of 80 pieces of Zunar's works divided into four categories, one of which is dedicated to the prime minister's wife, Rosmah Mansor. Among speakers at the launch were Article 19 executive director Dr Agnes Callamard and founder of whistleblower website Sarawak Report, Clare Rewcastle Brown. In his speech, Zunar said it was morally wrong for Malaysians to be neutral in the face of corruption and human rights abuses by the government. "All Malaysians should play their part. Let us stand together and fight. As a cartoonist this is my little contribution in this struggle. How can I be neutral, even my pen has a stand?" he asked, quoting his tagline. Visitors at the exhibition said they admired Zunar's works. “To me, Zunar is one of the two great legends in Malaysia apart from Dato’ Lat," said a Malaysian government officer, who wants to be known only as Amir, referring to well known cartoonist Mohamed Nor Khalid. 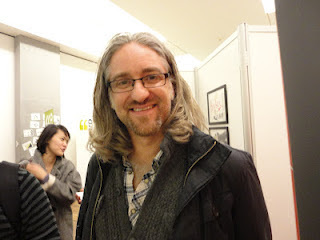 For IT manager Andrew Tynan, who said he had been hearing of Malaysian politics through friends, Zunar's cartoons complemented the information he received. 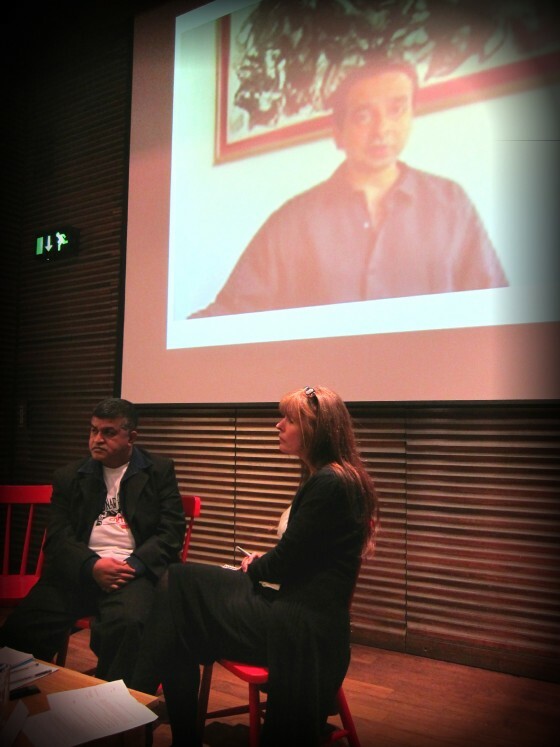 "Zunar’s cartoons are great in the sense that I could now relate the stories and understand the Malaysian politics better," he added. Malaysian student Adil Johan, pursuing his doctoral studies in King's College, said he liked the underlying message in Zunar's cartoons. 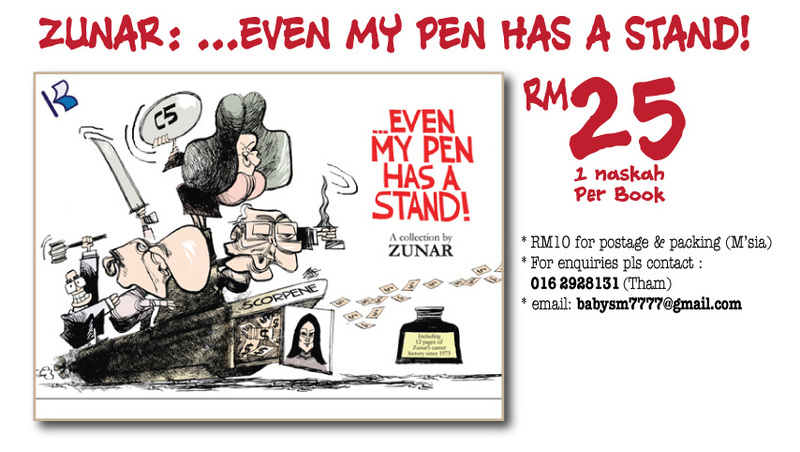 "I have been Zunar’s fan for years. When I first saw his drawings at the exhibition, I thought he has a very strong form of artistic expression that are open to interpretation," said Adil, who said he was not afraid to attend such an event, which normally attracts Malaysian security officials on the look out for students. Picture 2 : Agnes (left), Me & Clare. 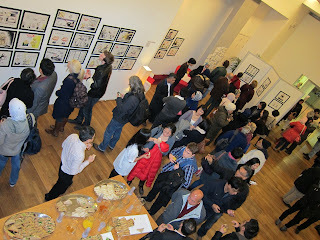 Picture 4 : "To Fight Through Cartoon" Free Word Centre, London. Picture 5 : "To Fight Through Cartoon" Free Word Centre, London. Picture 6 : Choosing Zunar's artworks. 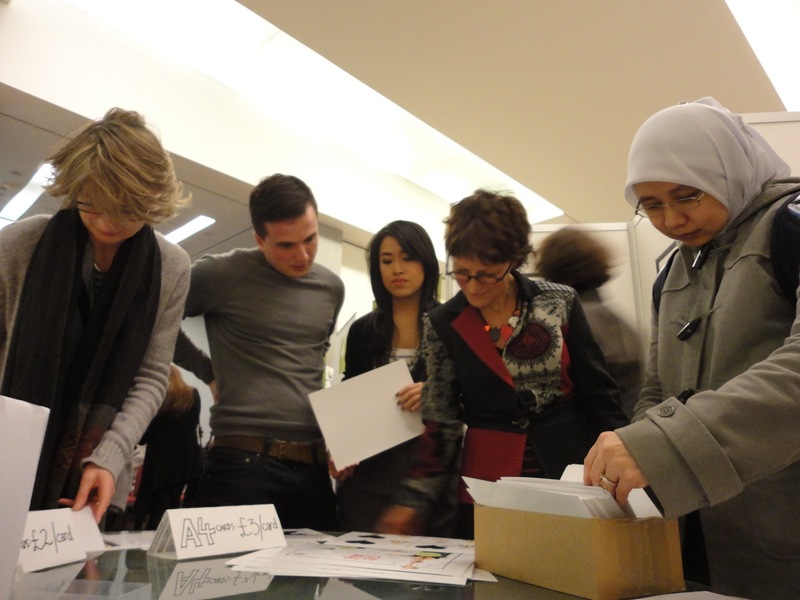 Picture 7 : Giving explanations to the audience. Picture 8 : Artworks at the exhibition. Picture 9 : Full House. 1. EVENT: The launching of Zunar's cartoon exhibition, "To Fight Through Cartoon"
3. 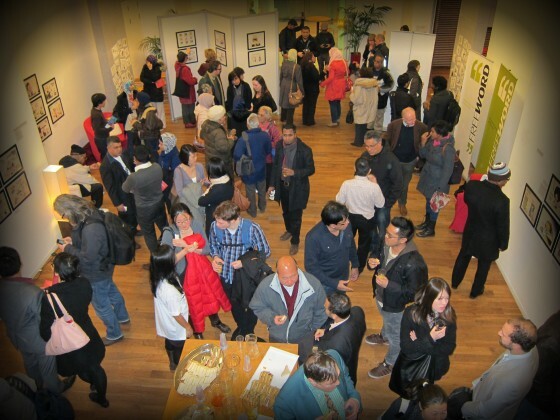 VENUE: Free Word Centre, 60, Farringdon Road, London. 4. ORGANISER: Article 19, an international NGO that fights for the freedom of expression and information. 5. THE EXHIBITON: It is Zunar’s first solo exhibition. 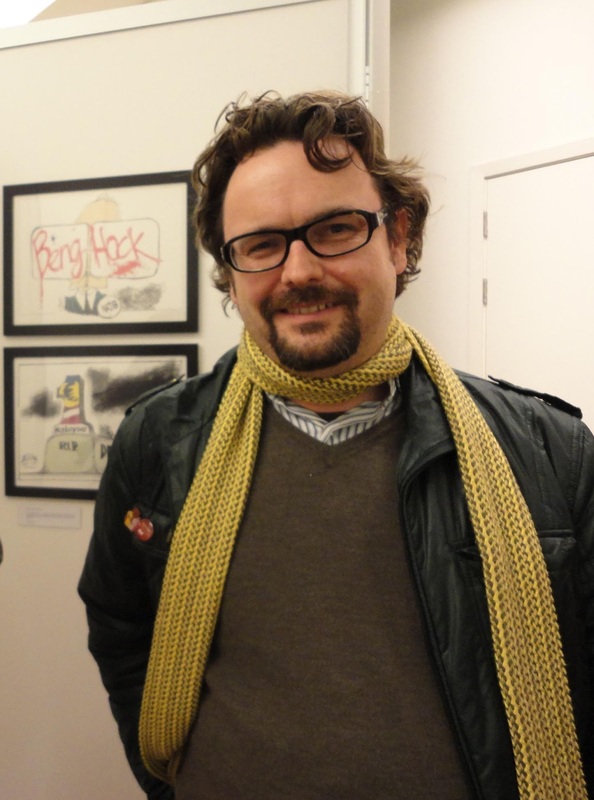 He has previously held two exhibitions with other artists in Bilbao, Spain. The 80-piece displays in the exhibition were divided into 4 categories – Najib, Rosmah, Conspiracies Against Anwar and General Issues. 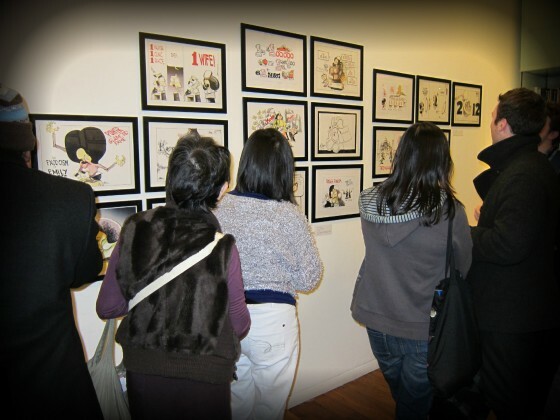 "To Fight Through Cartoon" will be held until 13th of March 2012. The gallery is open for free viewing from Monday – Friday, 9am – 9pm. 6. GUEST SPEAKERS: The founder of Radio Free Sarawak and Sarawak Report, Clare Rewcastle Brown and the Executive Director of Article 19, Dr Agnes Callamard. 7. AUDIENCE: full house of about 100; professional Malaysians, Malaysian students, locals. i. Started with introduction and welcoming speech by the Executive Director of Article 19, Dr Agnes Callamard, followed by a speech from Zunar and video-conferencing by the Malaysian Human Rights activist, Malik Imtiaz. “Malaysia is facing a moral crisis and beset by corruption, abuse of power and violations of human rights. It is a duty for us to take a firm stand against the repressive regime that has ruled the country for the past 54 years. It is morally wrong for us to keep quiet. The 13th Century poet Dante Alighieri said, the hottest places in hell are reserved for those who in times of great moral crisis maintain their neutrality. All Malaysians should play their part. Let us stand together and fight. As a cartoonist this is my little contribution in this struggle. How can I be neutral, even my pen has a stand?